I’d heard mixed reviews of The Rider from people who saw it at the 2017 LFF, and the first half left me cold, yes the stark landscapes were pretty and the non-professional actors weren’t terrible but nothing here seemed to touch the depths of the other boy and his horse movie Lean On Pete (which sadly hasn’t made the list). And then I am not sure what happened, but without any obvious change, I was suddenly completely drawn into this film, its mood and Brady’s dilemma swamped me with empathy. It is a great film for how it handles its mood, but I am still not sure how it managed this magic trick. Pixar usually grace the top ten, and whilst the Incredibles 2 made the most money it ended up about 48. Coco on the other hand is a welcome stab of this whitest of studios to go south of the (mainly theoretical) border and play with the day of the dead, which is not only Mexico’s signature holiday but also a goldmine for complex stories about family, memory and of course death. Also in this case too music, and memory too. Luckily Coco also is full of good jokes, and sidesteps much of Pixar’s timeless monoculture by doing Frida Kahlo jokes and thinking about the rich cultural, and cinematic, legacy of Mexico too. Paul Thomas Anderson in fusty mode and Daniel Day Lewis ahhhhcting – it was never going to win me over despite intriguing me with exactly where its plot was going. But the trials and tribulations of a white middle-aged narcissist was always a hard pull for me. That said the depiction of a drab world with hints of – if not beauty, stabs at it – was compelling (I firmly believe that all of the dresses are supposed to look terrible). Still if it means Day-Lewis has retired, there’s a minor win for us all. We got two Kore-Eda films this year, his serial killer drama was an interesting if slightly off kilter piece for him (though it does share prison resonances with this). Shoplifters on the other hand is prime Kore-Eda, there is the obsession with what makes a family, there is the anything to get by mentality of Nobody Knows. There is also his well diffused, but simmering anger about the position and treatment of children in Japanese society – I found it interesting that the end of Shoplifters seems to leave a character back in a perilous place but that is sort of the point. Go for the acting and the terrific dynamics, stay for the small p politics. It was nice to be reminded by The Incredibles 2 that animation may well be the best way to deal with the action and heightened storytelling of superhero tales, but Into(Enter) The Spider-verse is potentially the apotheosis of this. CGI which happily leans on the visual tropes of comics, and a story adapted from a comic idea from about five years ago, it happily freewheels through more high concepts than much of the MCU ever has whilst still being one of the funniest films of the year (and more vindication for Lord & Miller after being fired off of Solo). All to deliver a message that is both solid in its delivery of a new diverse mind set (we can all be Spider-Man) whilst also being nonsensical (no we can’t – we need spider powers!). Plus the best pop soundtrack of the year too. Go for the comedy, stay for the big P Politics. A satire with a capital S which recognises that subtlety is the death of satire, Sorry To Bother You throws so many ideas at the wall and then slowly tries to make them stick. It pretty much succeeds too, partially being centred around a nuanced lead performance from Lakeith Stanfield, but just because angry socialist films just don’t come out very often and are rarely this funny. It takes a number of odd turns which Boots Riley sells visually, and narratively, and he is happy for everyone in his film to be dissected as products of a flawed racist capitalist society. And Tessa Thompson’s art show (feat Lily James voice) is a pitch perfect gag. Of all of the movies looked over in award season at the moment, and in all of the cries of foul for no female directors in the shortlists, Debra Granik’s Leave No Trace seems the most glaring. Whilst less pulpy than her previous Oscar nominated film Winters Bone, that surely waved a flag for this sumptuous exploration of family, consumerism and PTSD. And again she solicits a subtle performance from a new young actor (in this case Thomasin McKenzie). Even handed whilst often highly suspenseful, its forest locations were a joy to watch and Ben Foster’s central flawed father was a great performance. Basically a near perfect treatment of its issues both beatutiful and affecting. The twentieth or so of the Marvel movies, and snuck in before the clusteroverload of Infinity War is surprisingly self contained, and has a barrel-load of interesting characters and politics. It is an afro-futurist paradise which creates a black myth which instantly counters centuries of cultural oppression. Not everything can be done by a film, and the lead character is the least interesting thing in it (that’s princes for you), but it takes the basic Marvel formula and loads plenty of baggage on it, it smuggles more than just a positive image through, its a cultural milestone. Greta Gerwig’s lightly autobiographical tale is not the most ambitious movie ever made. But yet again to repeat the empathy word, she manages to create a character (and a supporting cast) who feel completely real. And specificity is the secret of telling a more generalised story, Saoirse Ronan manages to be both sympathetic and utterly precociously annoying, and yet it is always entertaining to watch her learn as she makes these mistakes. Around her Gerwig builds a world which is often very funny whilst not compromising the reality of the piece. And in the centre of it is her mother Laurie Metcalfe (robbed for the Oscar) who is both a monster and the actual heart of the film. A glorious film, and a worthy winner for 2018. The Rider – which I haven’t seen. The Favourite – which I didn’t see until about 6 January, and therefore will have to remember not to vote for next time around. Phantom Thread – like Pete, am not a fan of Daniel Day-Lewis. Unlike Pete, I am a fan of Paul Thomas Anderson’s movies. The Day-Lewis effect was strong here, while PTA seemed (deliberately) somewhat out of his comfort zone. I did think it clicked into place about two-thirds of the way in, but that was a little too late for me. (I very much hope that the dresses were indeed meant to be hideous). More thoughts on it here. Everything else in that top 10 I loved – it feels very unlike me to say this, but I feel that it’s important to celebrate films like Shoplifters and Leave No Trace and their humanity. It would be easy from a clumsy description to mistake them for issue movies, which I insist they are not. 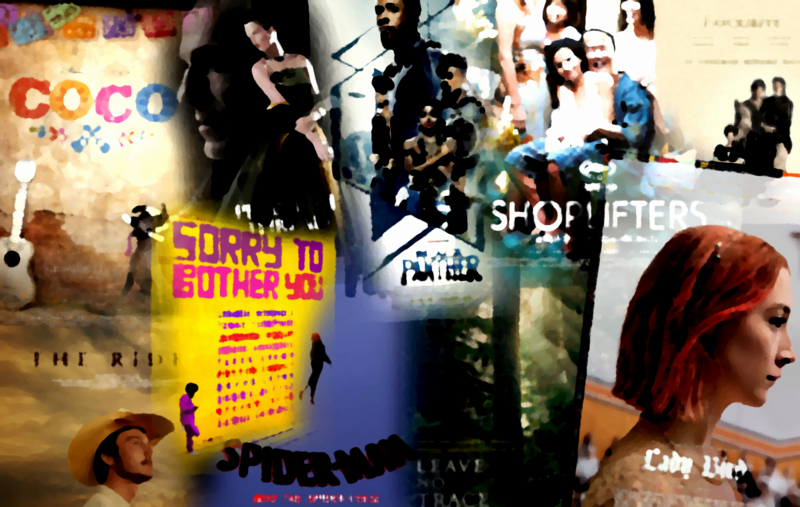 At the same time, it’s great that we have movies as wildly imaginative as Sorry To Bother You and Into The Spider-Verse. Here’s my list (strictly speaking, it’s very slightly different from my ballot for this poll). I saw Leave No Trace and Spider-Verse after the deadline but would have put both on my list, for what it’s worth. Anyway, I think everything I voted for made it except for Incredibles 2 and the fairly lightweight Netflix movies Set It Up and To All The Boys I’ve Love Before. I don’t know if anything I saw this year will go down as an all-time favorite, but it seems like there was a lot of stuff in the good to very good range.